Happy June everybody. 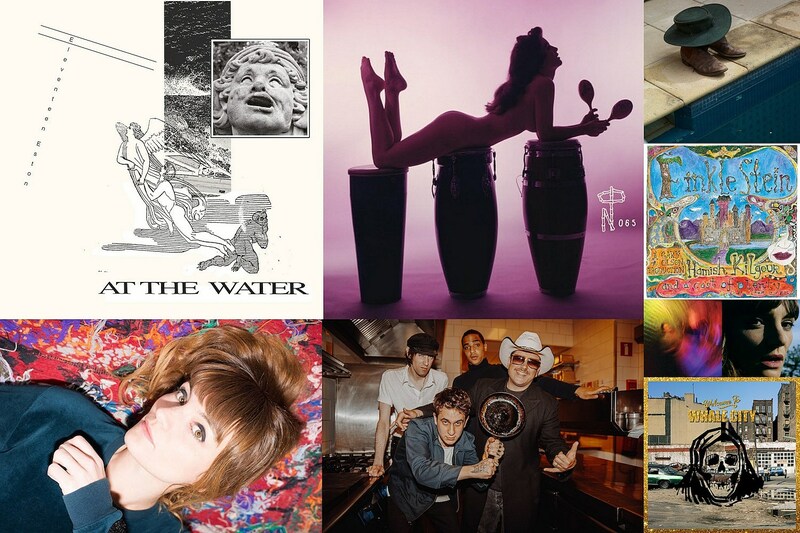 This week in the Indie Basement we’ve got the new solo album from The Clean’s Hamish Kilgour; French artist (and former Melody’s Echo Chamber band member) Halo Maud; a new ’50s exotica compilation from The Numero Group; balearic pop from Australia; and debauched party rock from Warmduscher (featuring members of Fat White Family and Childhood). Bodega’s great debut album was supposed to be out today but got pushed back till July but you can check out “Gyrate” now; we premiered a killer new song off Girls Names’ forthcoming album; and if you live in NYC, Chicago or L.A. please go see Australia’s The Goon Sax this month. Plus: regular readers of this column might recognize a few songs in BV’s May Playlist. The Clean and Mad Scene founder readies his fanciful second solo album. One third of The Clean and leader of The Mad Scene, Hamish Kilgour has indie rock bona fides out the wazoo but didn’t make a solo record until 2014’s All of it and Nothing. He’s only now following that up with solo LP #2, titled Finklestein, which will be out via Ba Da Bing on June 22. Hamish plays The Glove on June 18 with Simon Joyner & The Ghosts and Straw Pipes (more info). For those waiting patiently for the new Melody’s Echo Chamber album, I highly recommend you spin Je Suis Une île, the debut album from Halo Maud, the group led by Maud Nadal who played in one of the live incarnations of Melody’s Echo Chamber, and was a member of underrated band Moodoid. In full command here, she’s made a gorgeous album of ethereal psych with a distinct French twist. Other highlights: album opener “Wherever” should appeal to Blonde Redhead fans; the percussive and folky “Baptisme” has some real snarl; the exceedingly dreamy “Surprise” has the album’s second best chorus; and Je Suis Une île‘s title track is both funky and futuristic. While my calendar might argue it’s still spring, the thermometer says summer is here, so what better time to revisit Exotica, the kitchy, tiki torch-lit ’50s fad genre that combined easy listening, surf, and a myriad of tropical styles into one rum-spiked musical cocktail. The genre had a mild (could there be any other kind) resurgence in the mid-’90s with the rediscovery of Esquivel and Ennio Morricone, not to mention then-current acts like Combustible Edison, The Cardigans and Stereolab who bent lounge to their own whims. These records are a dime a dozen at thrift stores (your grandparents probably have a couple hidden away somewhere) and made with a wink, yet a lot of this stuff still sounds great nonetheless. Tireless crate-diggers The Numero Group must have flipped through hundreds of these to compile the just-released three-disc set Technicolor Paradise which avoids heavy hitters like Ferrante & Teicher and Martin Denny in favor the esoteric and obscure. Songs are awash in Hawaiian slide guitar, flutes, congas, singing saws, vibraphone, tribal chanting and ocean/jungle sound effects, and have titles like “Lotus Land,” “Lost Island,” “Arabian Rhythm,” “Voodoo Drums,” “Voodoo Kiss,” and “Magic Voodoo Moon.” (Those are not even all the “voodoo” songs on the comp.) You can almost smell the ocean and coconut oil (or at least a whiff of cheese) but this is a lot of fun — the surfy/Hawaiian stuff holds up the best — and would make a good soundtrack to your next theme barbecue. If you’re looking for a more modern form of exotica, might I suggest At the Water, the new album from Eleventeen Eston (aka Australian producer John William Tanner). Tanner, who is also one half of Wilson Tanner alongside Andras Fox, makes downtempo electronica awash in New Age synths, nylon string acoustic guitars, steel drums, flutes, bird samples and even some ocean noises. It’s closer to the balearic sounds of Studio and CFCF than the chillwave scene of the late-’00s — by way of ’80s Windham Hill CDs — but that gives you the general, calm, relaxed vibes Tanner is producing. It’s all filtered through his good taste and expert ear, and makes for a calm but engaging listening whether you’re “At the Water” or not. The sound of partying way, way, way past bedtime via this collective featuring members of Fat White Family. Warmduscher aren’t so much a supergroup as they are some likeminded mates who make music together when not playing in other bands. The group is led by Clams Baker (Paranoid London) and also includes Saul Adamczewski and Jack Everett (both of Insecure Men/Fat White Family), Ben Romans-Hopcraft (Childhood), and Quinn Whalley (also of Paranoid London). Together they make a racket that’s equal parts indie rock, whiteboy funk, urban cowboy sleeze, and some hiphopisms. Their new album Whale City, out today, sounds like a half-remembered party from 1996 featuring Jon Spencer, Country Teasers, Scott 4, Beck and uninvited gatecrashers Fun Lovin’ Criminals. If that sounds like a nightmare, well maybe, but they make it work via the record’s pervading seedy underbelly atmosphere. There’s a lot of talent in this ragtag group, no one is taking themselves seriously and they’re clearly having a lot of fun jumping from style to style: “Big Wilma” is a one-chord punk wonder and end-of-the-night thrasher; “1000 Whispers,” is a down-on-my-knees-begging-you-please soul workout, and the LP title track dabbles in Peter Gun noir-surf. Remember that time we stayed out all night and did too much of everything, where everyone slow-danced and moshed? Neither do I but Warmduscher may have been the band who played. Looking for more? Browse the Indie Basement archives.